The H. Upmann Legacy hand-rolled premium cigar line is a relatively new blend on the market today. These cigars are tightly rolled individually and packed with high-quality, fermented Nicaraguan and Dominican tobacco leaves used for the long-fillers, secured by a Nicaraguan binder, accompanied by a dark-brown Ecuador Sumatra wrapper. H. Upmann Legacy premium cigars are packed inside beautiful cedar boxes and labeled with the company’s mark to maintain authenticity. Each time you try these medium to full-bodied Dominican cigars, you’ll receive a unique smoking experience that is bold yet refined as hints of cream, nuts, cedar, spices, and cocoa are delivered through an even burn. 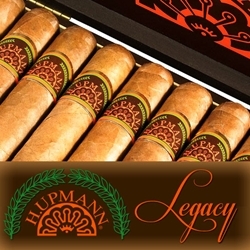 The H. Upmann Legacy is a vintage hand-rolled premium cigar series offered with modern appeal. Smokers Discounts has made it easy and affordable to buy H. Upmann hand-rolled cigars online. Every product can be delivered right to your doorstep. A variety of sizes and flavors are listed below in our online cigar store. Each of these styles are in stock and available for a low discount price! Call us for more details!